Deep in the basement of Starhill Gallery, lies one of KL’s most exciting food secrets. If you’ve never been to Feast, then you need to treat yourself to a visit. From the moment you step on the red escalator or descend in the bubble lift, you’ll be transported into a world of elegance and creativity. And just a hint, don’t miss the absolutely charming washrooms! 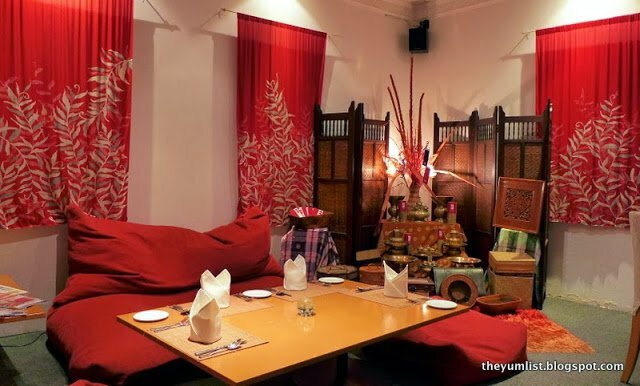 Tonight it’s a discovery of true Malay Cuisine at Enak with dual mottos of ‘Unfailing Hospitality’ and ‘Delight in Every Bite.’ The atmosphere is calm and rich with an exotic red and cream décor, and a corner option of lounging cushions. Although we’re seated at a table for our tasting, I imagine myself returning to relax on those tempting cushions at the low table in the corner, where a display of traditional artefacts give more than a touch of authenticity. Host, owner and visionary Sherena Razaly, bubbles over with enthusiasm for her cuisine and the food scene in KL. She stresses the importance of motivating her team, and credits her success both to her great grandmother’s recipes and her knowledge of corporate structure. Well something’s working, as the team appears to stay on, unusually for KL both chefs having been on board from the start, eight years ago. During the delightful conversation, Monica has started photographing and already delicious smells are wafting my way. First for our delight is the Enak appetizer tasting (RM32++), which forms part of their mini degustation menu. It’s a sea influenced starter with Cumi Cumi Garing (deep fried squid), Udang Bakar (grilled prawns) and Pergedel (potato patties). The prawns are delicious, with a tart fruit concoction and fresh peanut and chili sauce, while the potato patties are delicately flavoured with nutmeg. Monica’s lucky to make it back in time to taste! 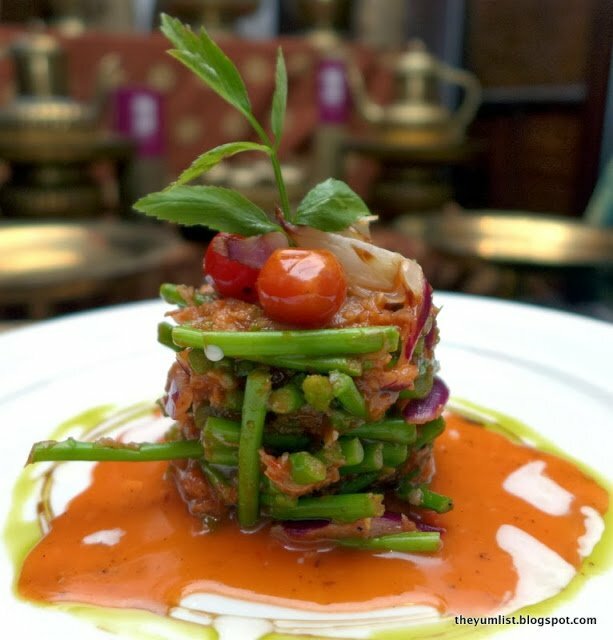 Tender asparagus tossed in fresh red chilli and lime juice laced with freshly roasted grated coconut is Kerabu Asparagus (V, RM18++). 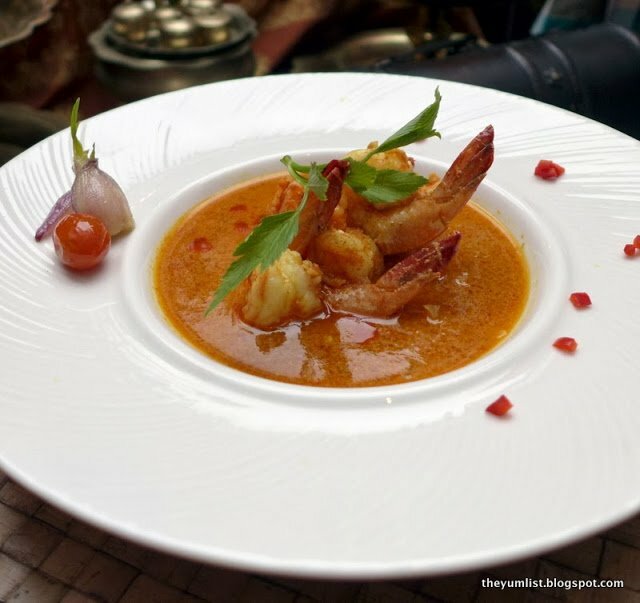 It’s a stunning plating and we all agree that we’ve never seen such fine dining Malay style. I can taste the freshness and the texture of the roasted coconut, surprisingly successful with the young asparagus and just a hint of chili spice. Apparently popular with international guests. Udang Lemak Merah (RM 32 ++ for 6 medium prawns) is a prawn dish that this time derives from dad’s side of the family. The succulent dish leaves a satisfying tinge of spice on my lips and tongue from lemongrass and a spike of fresh chili. All is simmered in a candlenut sauce, which gives the creaminess of coconut without the cholesterol and calories. Yippee! 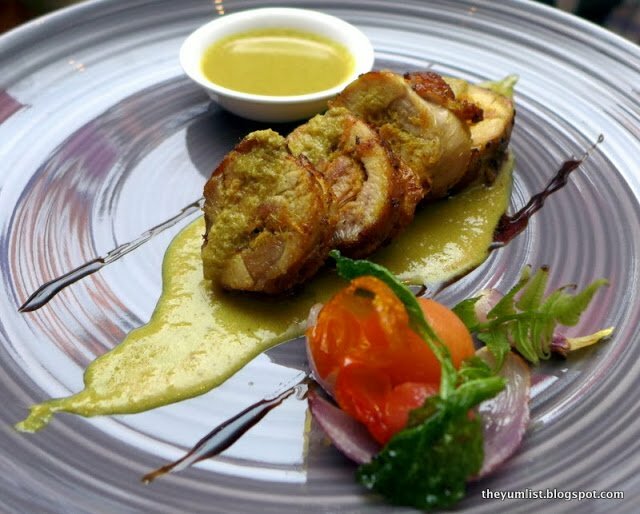 A chicken dish so insinuating and soft in the style of a roulade, surprises us all by being Ayam Percik (RM25 ++). Monica and I both make the same comment; ‘Like no Ayam Percik you have ever tasted before!’ This traditional Malay chicken dish has been lightly grilled in a marinade of galangal lemon grass and coconut milk. I’m not exaggerating to say it’s a revelation and if you’ve not been impressed by this dish before I promise you that you will love Enak’s interpretation. 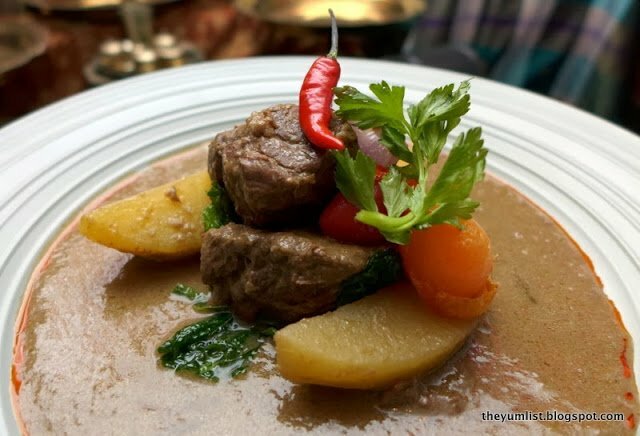 Daging Kurma (RM29++)is NZ Topside simmered with Enak’s signature blend of spices in coconut milk over a low fire for a few hours. The texture of the beef is delightful and flakes off the fork beautifully. The flavour is reminiscent of a very light korma, so for people who don’t like spiced food, this is a good option. Sherena contributes, ‘My mother taught me that Malay cuisine is actually very complex, and the order in which the ingredients go in is very important. You need to be patient and wait for the aroma and the flavour to come out.’ We’re so glad she did! Accompanying rice is served from the basket, so you can have as much or as little as you want to complement your dishes. On to dessert and Pisang Caramel (RM18++) is recommended as a good light end to the meal. It comes with Ais Krim. I do love the Malaysianisation of certain English words! 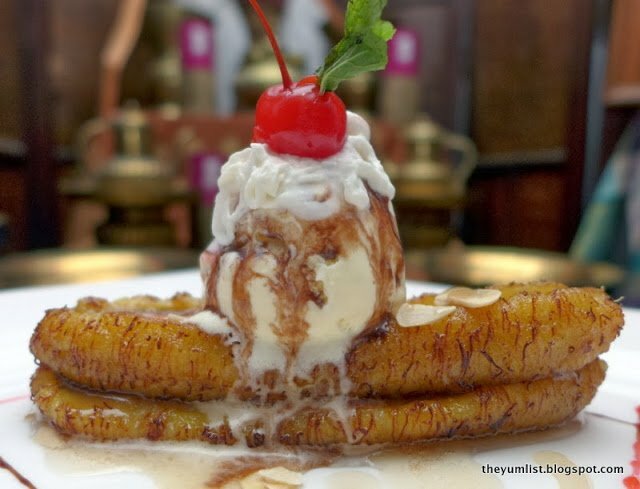 The lightly sautéed bananas are a contemporary version of an old classic. Almond flakes add a nice crunch to ripe bananas, which are naturally caramelised with a quick dip in hot oil. Enak’s signature cardamom caramel sauce gives a fragrance and richness, which is made even more decadent with the addition of creamy vanilla ice cream. I shamefacedly admit that I didn’t want to taste Sago Gula Melaka Sur (RM12++), a most traditional Malay dessert that I have never enjoyed. I take the teeniest portion for the sake of tasting and then had to go back for more. Sherena says she takes that as a huge compliment. 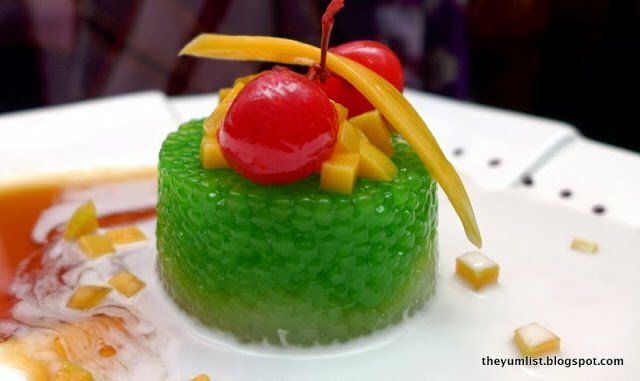 Fresh white sago pearls fading into a soft green where they have been tinged with light pandan are surrounded by the most delectable mix of a coconut milk and melted palm sugar. Teensy chopped slightly sour mangos are an inspired touch that totally makes the dish. Our last treat is Manisan Kelapa Muda Enak (RM18++), a recipe that mum still won’t hand over because she reckons chef still doesn’t quite have the lightness of hand that is needed to make the custard! Sherena laughs, ‘In my family we love food, it’s all about the food. My sister’s the cook I’m the baker, but my mum is an all rounder, she can know whether a recipe will work or not just by looking at it!’ Well this one works for us! A spoonful of exquisitely textured young coconut strips in rich velvety custard is simply luscious. Add an impossibly feather-light cloud of fresh meringue and we’re all in total ecstasy. It’s an extremely delicate dish. Is it possible to be delicately decadent? Hmm… I think it is! 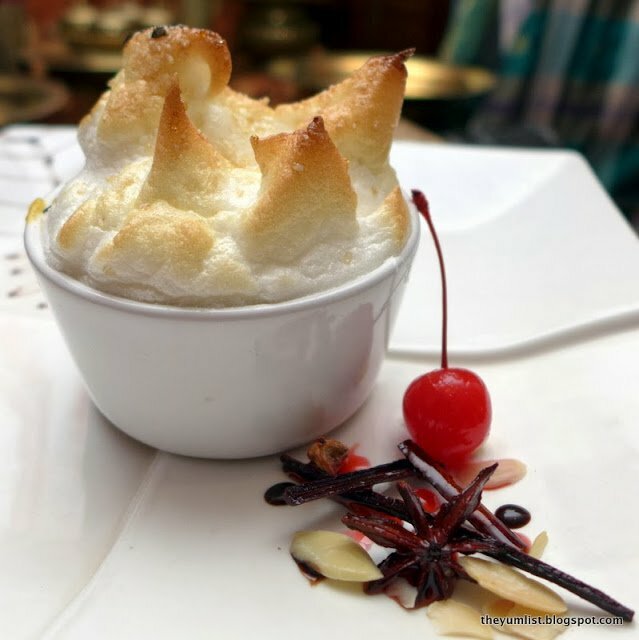 If you would like to try more than one sweet dish, Enak also offers a dessert tasting plate. I love this idea. 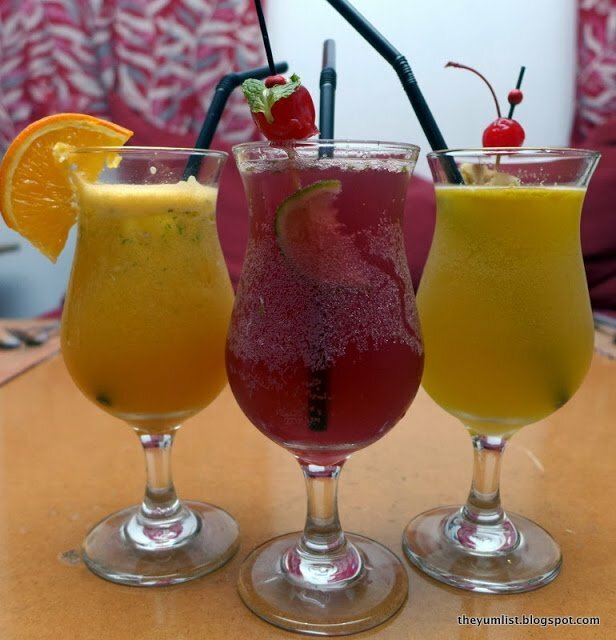 We accompany our meal with a selection of original mocktails. I’ll leave you to guess which classics the amusing names are based on. Caipiminto is very light and fruity with a minor cherry undertone. It’s a summery drink, reminiscent of a Pimms and lemonade, though too many of these on a hot day are not going to make your head spin! ‘Rose-Teani’ is made with cold black tea, so I find it surprisingly sweet with more than a hint of rich Turkish delight, cherry and rose undertones. I’d recommend it for those with a sweeter tooth. Sunrise Sunset appeals to us as kiwi, mango, pineapple and ginger are some of our favourite flavours. I expected it to be more peppery and again it’s on the sweeter side. The lemongrass notes of ‘Cool Green’ appeal to me, with an intruiging blend of, lime, kiwi and chamomile tea. Citrusy slide is a delicious mix of mint, lemon and orange with just a tinge of honey. All of us vote it our favourite, the natural honey is a special something. All Mocktails are RM17++ so I’d pop in for one if you’re shopping and get thirsty. Drinks wise there is also a range of classic and original cocktails. Even if I don’t drink, my guests do. The wine list features 35 labels of red and white wine, many from Australia. Every month Sherena offers a different gourmet menu consisting of five courses with wine pairing for RM175++. That’s a steal for KL! Jemputlah Makan’ (Come dine with us) declares the flyer. I can only recommend that you do. Reason to visit: You won’t find this experience anywhere else in the city. 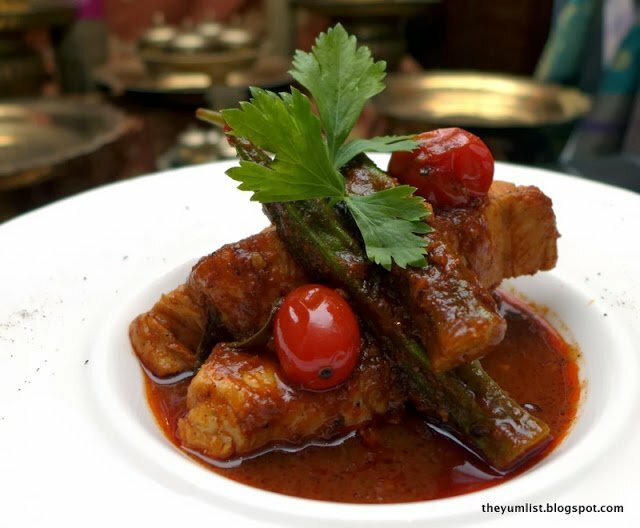 Traditional Malay food, with a fine dining twist, and total quality ingredients. Unmissable if you have overseas guests. I am Benson from TABLEAPP, a free online restaurant reservation with instant confirmation. Kindly be informed that we refer part of this article on our website and credit back to your blog to browse the whole article. Please do not hesitate to contact me at [email protected] if you have any inquiry or interest to join our affiliate program. LOVE the red decor! 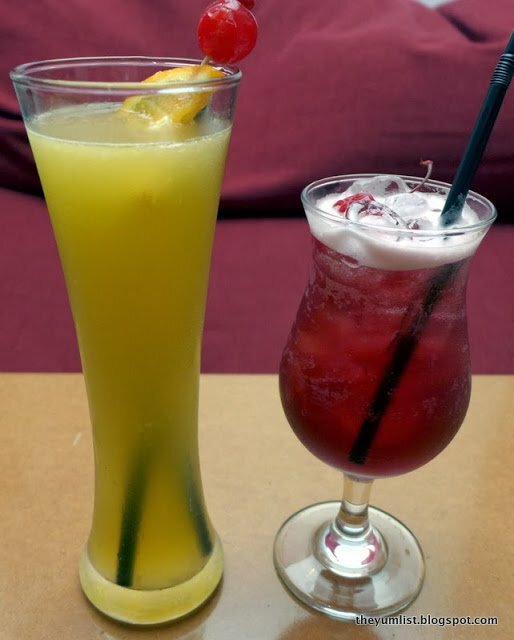 And those Mocktails!? nice! I'm the editor of The Yum List. I have a passion for food, travel and having fun. Together with my team of writers I hope to lead you to delicious and enjoyable experiences around the world.